Fauer, Sauer and Schopf (right to left). Leica Camera CFO Ruud Peters takes good pictures. 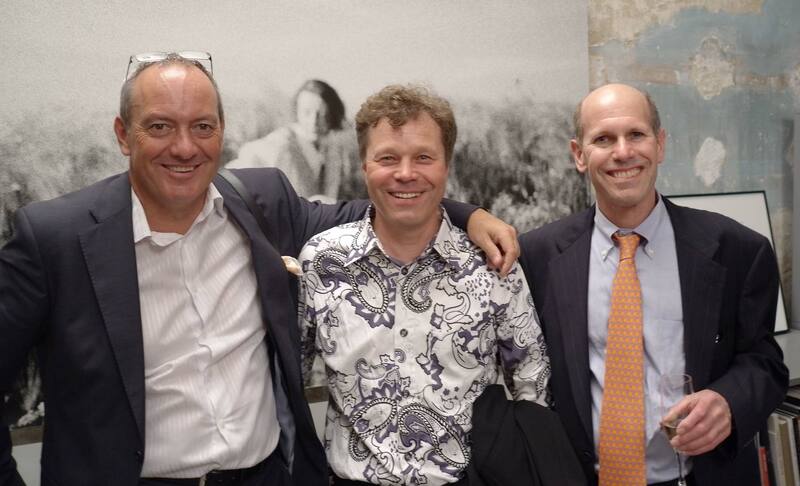 He used the new Leica X2 to get this shot on Thursday evening at the C/O Berlin Leica Event–of Eberhard Sauer, a prominent photographer (and Leica user) specializing in cars and products, Alfred Schopf, Leica Camera’s Managing Director, and a guy with a tie. About the Leica X2 camera: it is the X1 successor. The new, APS-C-format CMOS image sensor is 16.5 megapixels (effective 16.2 MP – 23.6 x 15.8 mm). The Leica Elmarit 24 mm f/2.8 ASPH. lens has improved autofocus. Several features make this an ideal constant-companion camera. The camera’s aluminum body is lightweight and pocketable. Its excellent auxiliary electronic viewfinder (requiring a somewhat larger sartorial accessory cargo pocket) makes much more sense for composition and focus than arm’s-length-glary point and shoot and hope for the best competitive models. Analog, intuitive dials on top take you from from full manual control to automatic functions. Line up the two “A’s” for Automatic or choose from Aperture or Shutter priority (below). The X2 excels in low light, with a range of ISO 100 – 12,5000. I believe the X2’s CMOS image sensor comes from Sony, with size and specs not dissimilar to Nikon’s D7000 DSLR. That is quite a feat for such a compact rangefinder classic style camera. The Leica X2 CMOS sensor provides live-view on the camera’s 2.7″ monitor or EVF. The field of view of the Leica X2 Elmarit 24 mm f/2.8 lens is comparable to a full-frame 35 mm still lens of 35 mm (because of the 1.5x APS-C crop factor). This is classic focal length that captured the imagination of many photographers who captured countless iconic images. The X2 design is reminiscent of the Leica M. It is available in black or silver finish. Accessories include a Viso-Flex 1.4 megapixel electronic finder that swivels 90° up. A bright-line mirror “sport” finder can be mounted on the accessory shoe for “optical” framing without having to rely on electronics. The camera is made by Leica in its factory at Solms, Germany. The camera is ready for delivery now.